What’s BT up to in the north-east? Last week BT said it would lease up to £15,000 worth of technology and telecommunications to businesses in the North-East, Yorkshire and Humberside that had been trading for less than three years. A typical £3,000 lease would cost less than £20 a week, it said. That sounds like a good deal for start-ups, but one wonders whether BT shareholders would be so keen on the deal. If one takes the £3000 on offer over three years and pays back £80 a month for 36 months, the start-up ends up paying a total of £2880, which is a -2.63% interest rate. 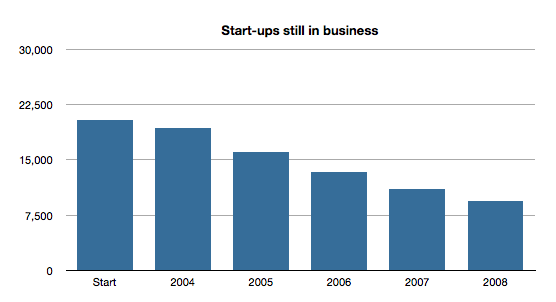 Moreover, BT will presumably have factored in the mortality rates of start-ups in the area. The latest ONS figures, for 2004-2008, show that one-third will die within three years, and more than half within five. Figures post the banking crash are likely to be much worse. Since banks won’t give start-ups ice in winter, let alone a loan, and there is no way BT can make a profit from this, this seems an overly generous offer. So why is it doing it, and why is it not available to start-ups in the rest of the country? Is this something for the Office of Fair Trading or perhaps the Compeition Commision to consider? Ian, Could it have anything to do with the Thales/Al-Lu/Kcom Digital Region project i.e. the loan is subject to taking BT Broadband rather than broadband from the Digital Region project??? Hmm. Interesting point, John. But doesn’t BT supply Digital Region with infrastructure? Could it be it’s heads BT wins; tails Digital Region loses? I think we already mentioned the north east. BTW, BT folk tell me it’s nation-wide, only they didn’t mention it in the press release for their own reasons. I believe several others made that point earlier. So, Dan, how much is BT going to refund Digital Region and Thales for overcharging them?